Ready to showcase your ninja skills by infiltrating a lavish temple in the Far East? If you are there are huge rewards to be had as the temple is filled with gold ornaments and statues for you to retrieve and exchange for cold hard cash, however you’ll have to slay the Red Dragon which guards it all before you can make your escape – feeling up to the task? While Blueprint Gaming are no strangers to releasing dragon-themed slots as we have already published an Imperial Dragon slot review, Red Dragon takes a different approach with you arming yourself with throwing stars and nunchakus to unleash the Bruce Lee within you and force your way to riches by defeating the ferocious Red Dragon and scooping all the golden valuables for yourself. With a structure of 5 reels and 50 fixed paylines, you can make your way to the Far East to battle against the fearsome Red Dragon from 50p up to £5. The sounds and design of the reels create an intense atmosphere as you ready yourself to take on the dragon and while many of you may quiver in fear at the prospect, it’s well worth being brave as you could trigger an incredible free spins feature where you can also access a bonus feature titled Enter the Dragon for unlimited spins, plus you could scoop the Gold Jackpot if you’re really lucky! 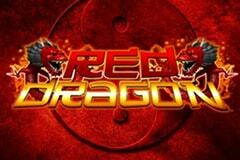 The symbols which Blueprint Gaming have designed for the Red Dragon are typical of an Oriental-themed online slot with striking special symbols featuring on the reels to create the drama of you doing battle against the Red Dragon to get to all the gold. You’ll be represented by a ninja dressed in all black with the sky darkening behind him as he clutches a blade in each hand to battle against the dragon and this is the Wild symbol which can substitute for all but the Scatter symbol. You won’t be surprised to learn that the Scatter is represented by the roaring Red Dragon who is key to accessing the free spins feature, plus there are also stacked golden dragon symbols which are the most valuable of all, delivering up to 10x your stake. There is also a Yin/Yang symbol, throwing stars and nunchakus which will help you go toe-to-toe with the powerful dragon, red tokens and Ace to 9 icons which have been designed with an Oriental flair. You can often catch the Red Dragon in a good mood which will get him onside and on friendlier terms with you rather than engaging in a gory battle. This is highlighted whenever the Red Dragon Scatter symbol lands on the first, second and third reels at the same time as the Red Dragon grants you the power to spin the reels with no costs incurred – now that’s the type of friendly dragon I like! The Red Dragon will grant you 14 initial free spins during which the Wild symbol will appear as a Stacked Wild symbol on the second, third, fourth and fifth reels which significantly increases your odds of winning big. On top of this a new symbol enters the arena which is the Enter the Dragon Scatter symbol and whenever this lands on the first, second and third reels it will activate the locked free spins bonus game where you can spin the reels up to a maximum of 500 times, however all the fun ends whenever the Red Dragon Scatter roars onto the third reel. During gameplay, you will hear the Red Dragon roar ferociously as flames burst onto the reels, however despite the fantastic sound effects and design, the base game wins are nothing to roar about with the free spins feature being the only thing you will find yourself getting excited over. Fortunately, there are countless Oriental themed slots which feature dragons to play instead with some of the most popular being the Dragon’s Wild Fire slot from Mazooma and the Dragon Dance slot from Microgaming, both of which offer greater base game wins while maintaining an incredible design and even more exciting bonus games to ensure the reels are red hot throughout!